I really enjoy designing quilts and writing books because they provide the opportunity for me to continue discovering endless new ways of doing things. When I wrote my first book, Stack the Deck, I definitely shared "my way" and as a result, I've had the pleasure of teaching hundreds of students to stack, cut, and sew their own decks. 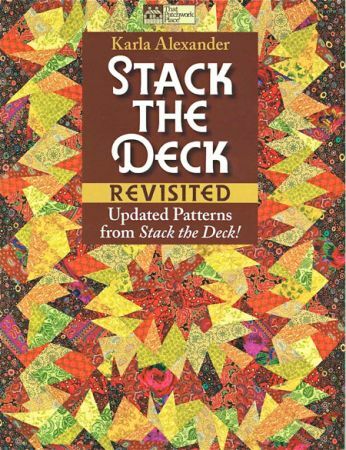 With Stack the Deck now out of print but still in demand, I decided it was time for an update. Originally the plan was to simply reproduce the quilts in new fabric for an updated look. I tried very hard to stick with the plan; however stacking, cutting and sewing decks is so much fun, and I got so caught up with the possibilities, that before I knew it, I had changed most of the original quilts using new ideas and variations. I couldn't help but share a new spin that had evolved over the past several years. I've gained an enormous amount of knowledge from teaching, and new inspiration seemed to sprout with every new quilt.